Lower level part of the window sash frame. Sloped strip of wood allowing water to flow away from the window. Exterior panel made of solid wood protecting the glass portion of the window. Small metal part pivoting on a gudgeon to let the casement swing. Curved part holding the jalousie or shutter in place. Fixed frame encasing the movable part of the window. Vertical part of the frame to which the hinges are attached; it allows the window to open. Movable window panel, with or without glass, that swings on hinges. Exterior panel composed of horizontal strips protecting the window from the sun or rain while allowing air to pass through. 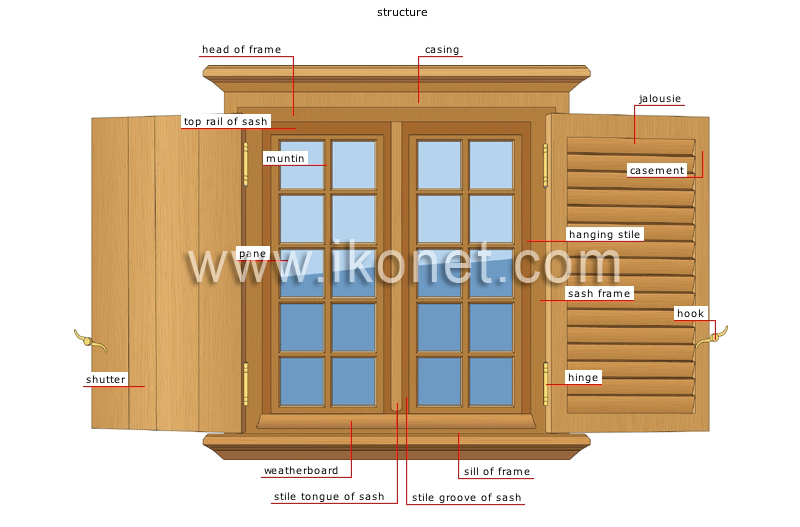 Protruding border surrounding the sash frame of the window. Level piece of wood at the top of the movable part of the window. Small glass plate in a window or door. Small jamb or crosspiece holding a window pane in place. Upper level part of the window frame. Vertical part of the frame with a rounded side that fits into the stile groove of the sash. Vertical part of the frame with a concave groove; the stile tongue of the sash fits into it.